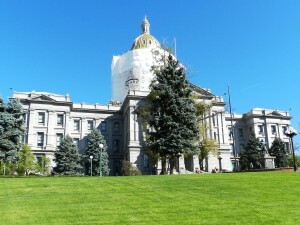 Linda Burton posting from Denver, Colorado – Port-a-potties behind a chain-link fence were my first glimpse of the Colorado state capitol this afternoon, not a pretty sight. Snow and cold gone, warm blue skies lured me downtown; I turned right off Colfax and parked on Grant Street behind the capitol. Straight in front of me in the paved circular walkway was a statue of a Native American standing over a dying bison, surrounded by prairie grasses, it seemed. 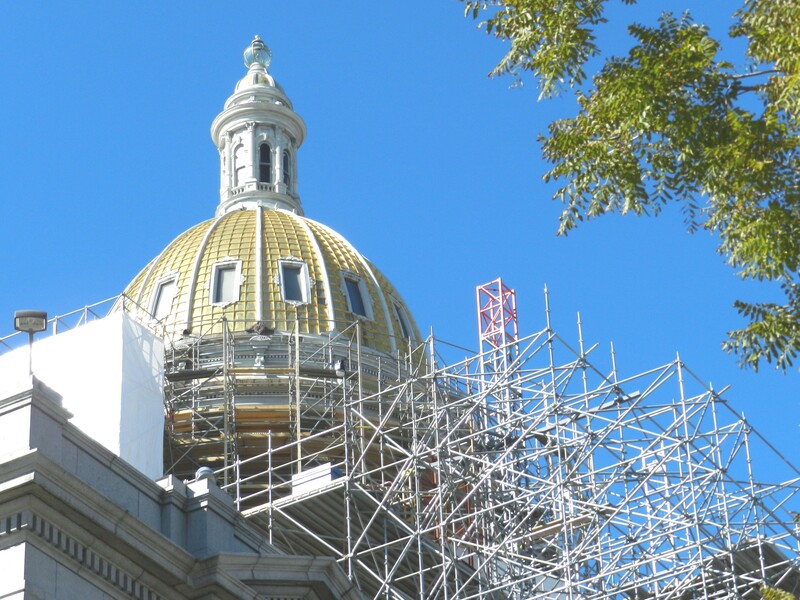 The dome of the capitol was encased in scaffolding, the lower part further sheathed in a blanket of white. On the left more scaffolding stretched from the ground to the top of the building, cordoned off by that chain-link fence. I’d heard about the renovation needs; the rusting iron and falling building chunks that had resulted in “hair-netting” the dome since 2007. So now it’s underway, a three-year, $17 million project. Camera in hand, I began to walk around the block, hoping to get a clearer picture of exactly what was going on. Scaffolding, and squirrels, were what I found. Back in my room, I researched the skinny on that three-year project. Work began last year and is expected to be completed by May 2014. The scope is enormous, because, well, the work is long overdue. 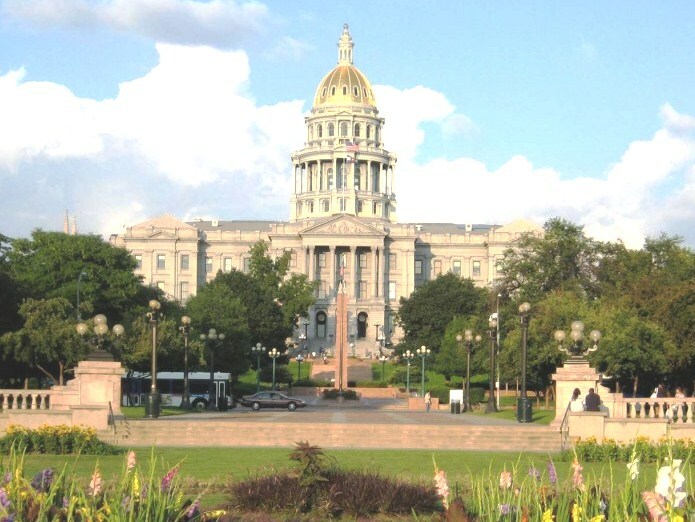 The structure has deteriorated over the past hundred years due to water infiltration and the intense freeze-thaw cycle of the Colorado climate. The gray columns that support the golden dome have a granite look, but actually they are cast iron. And iron rusts. Up to now, only “touch-up” work has been done, repainting over rust and old paint. You know what happens with rusting cast iron over time – it falls apart. That incident in 2007 occurred when iron fasteners rusted through, allowing a 10-pound chunk of cast iron to fall from the ceiling onto the balcony. That’s a no-no for a public building; the balcony was closed and efforts begun to finance repairs. The Legislature dedicated $4 million from the State Historical Fund for the work, and Colorado Preservation Inc set about to raise $13 million from private donors. Preservationists asked for public help; a Share in the Care campaign was begun. This time, the plan was to get to the bottom of the problem, and do it up right. It will be painstaking work, with scaffolding going up in three phases. Workers will scrape off the paint a little at a time, make repairs to the iron if necessary, seal it, and repaint it. The original builders used lead paint, so the scaffolding will be draped in a protective fabric when the paint is removed. 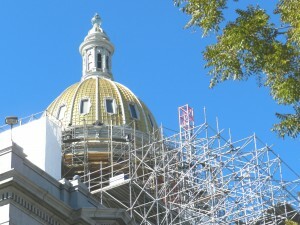 Near the end of the project, the gold on the dome will be replaced, along with the century-old copper panels underneath. Good news there, AngloGold Ashanti has pledged to donate the 72 ounces of gold needed for that. 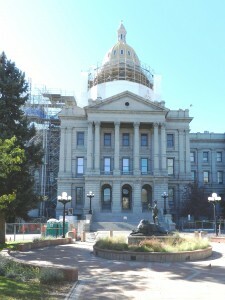 The famous golden dome is a favorite Front Range tourist attraction. 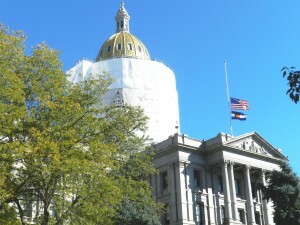 The architect, Elijah Myers, planned for a copper-plated dome, but Colorado citizens wanted something grander. It was 1908 when 200 ounces of 24-karat gold leaf was donated by the Colorado Mining Association (eleven capitol buildings have a gold-plated dome). 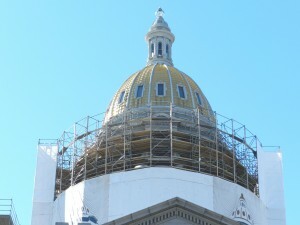 Since then, the dome has been regilded in 1949, 1980 and 1991. So that’s the story, for now; that scaffolding won’t be down during my visit. (I include a previous photo not taken by me so you can see it without.) When they’re done in 2014, let’s hope another hundred years goes by before such a project is necessary again. 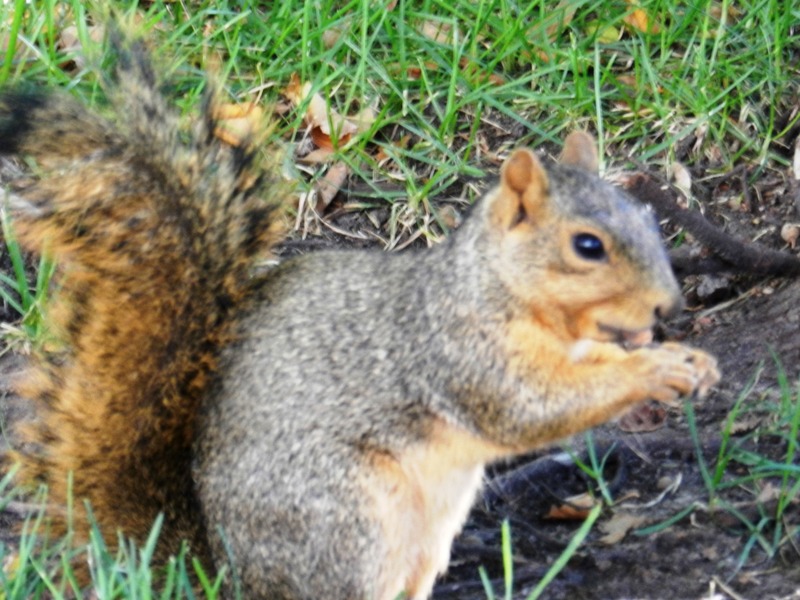 Meanwhile, the squirrels don’t seem to notice. The Colorado State Capitol Building, located at 200 East Colfax Avenue in Denver, Colorado, is the home of the Colorado General Assembly and the offices of the Governor of Colorado and Lieutenant Governor of Colorado.